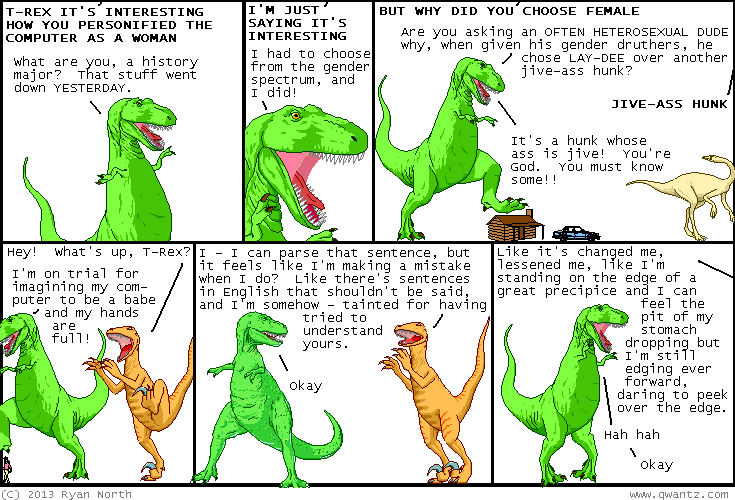 Dinosaur Comics - April 23rd, 2013 - awesome fun times! April 23rd, 2013: If you view source on this page and scroll waaaaay down you'll see a little surprise that comes courtesy of Ben! I've been posting a lot about the Adventure Time comic I write, but until now you couldn't read it online for free! THAT HAS ALL CHANGED, YO..
Also the sequel to Machine of Death, called This Is How You Die, is on the Publisher's Weekly Best Summer Books 2013 list! NICE. You can't get the book yet but it'll be available in July! I will be sure shout far and wide when it's available.